On April 24, Hitachi Maxell announced the development of a fuel cell battery that relies on water and aluminum to generate electricity. Measuring 16 (H) x 10 (W) x 6 (D) cm (6 x 4 x 2.5 inches), the simple, low-cost device produces an average of 10 watts of power. The company claims to be working on developing it as a power source with up to 100 watts of power, and they hope to see the fuel cell use recycled aluminum scrap. The device is described as a type of proton-exchange membrane fuel cell that generates power by combining hydrogen with oxygen in the air. Separate cartridges contain aluminum and water, and hydrogen is generated as water is gradually added to the aluminum. 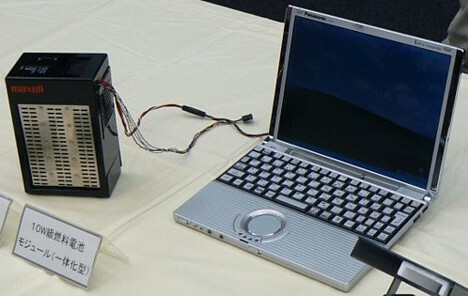 With 20 grams (0.7 ounce) of aluminum, a laptop can be powered for 4 to 5 hours. I don't think it is a good idea to use aluminium as a catalyst. Just because we still need to destroy mountains for this. If we did not have better options it would be fine, but it seems the best options are constantly being removed from public view. A good option is an option were a consumer is not dependend on a few suppliers. This means decentralized supply so we don't have a monopolistic energy market. Like sun or wind, people can harness themselfs. But a pulsed DC electrolysis system is by far the best way. You should look it up. I agree with Bart- How much does 20 grams of aluminum cost anyway? It would be cool if you could just stick an empty coke can in the top to provide the aluminum needed, but what happens when we run out of aluminum cans? its amazing what can be done these days lol.. Does anyone really believe that it takes higher gas prices to motivate research and development into alternative fuel sources?